A drone is being developed for use in the north of Scotland. New drone technology could save lives across the north by locating missing people more quickly and helping to focus search and rescue operations. The Maritime and Coastguard Agency (MCA) is developing the device for use during searches in water and along coastlines around the Highlands and Islands. A trial, taking place in England from April, will inform the agency on the type of model that will be relied upon to assist during some of the organisation’s most difficult operations at sea and on land. It is hoped the drone will be able to assess emergency situations quickly and efficiently, and could also assess the extent of problems such as oil spills. An MCA spokesman said: “Broadly speaking, we are exploring two operational areas; the use of small drones, rotary and fixed wing, in local tactical situations and the use of larger drones operating beyond visual line of sight. “These latter devices will initially be in the maritime domain, to provide support to rescue teams, to monitor pollution and to help with vessel traffic management. “The MCA is also looking at using the utility across government for departments with a maritime interest, who would wish to use an air platform to conduct work such as coastal erosion and counting sea birds. “The list is long and we hope to harmonise these requirements to ensure better value for money across government in provision of these services. “We are planning a 12-month operational evaluation in April with a police drone team working alongside Coastguard Rescue Teams, and the RNLI. The smaller drone would be equipped with thermal imaging technology to locate missing people. The spokesman said the “next steps” will include determining the value that a drone could offer the MCA. 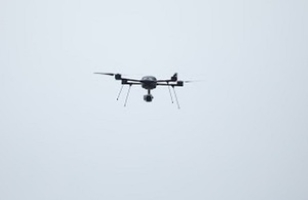 He added: “We are working closely with other emergency services to exploit existing drone usage, including integrating these into Coastguard Rescue Teams.